Few online marketing strategies have gone through as radical an evolution as link building. What originally started as a cut-and-dry, quantity-based strategy almost guaranteed to increase your rankings has turned into a much more complex system thanks to Google’s sophisticated, ever-advancing Penguin update. But here’s a secret about modern link building you may not be aware of: it’s only complicated if you make it complicated. Yes, Google is able to view and rank more qualitative, sometimes hard-to-identify factors with your links, and you can’t objectively calculate the value or impact of a single link, but if you boil down all the possible avenues for successful link building in the modern era, there are only three viable tactics. What do I mean by viable? The strategy must carry no risk. This immediately excludes old-school strategies, such as posting links in comment fields, and black-hat strategies, such as spamming links or participating in any kind of link scheme. The strategy must earn a benefit greater than its initial cost. There are some link building methods that end up passing a marginal amount of authority compared to the effort it takes to establish them, such as single links on low-authority sites you might “buy” on Fiverr (and these are very risky, too). The strategy must be repeatable and scalable. It’s not enough to have a one-time effect. A good strategy needs to be consistently repeatable and have room to grow. A Super Bowl TV advertisement that generates a lot of buzz on social media channels, which in turn generates brand mentions and links in subsequent news articles. A successful Kickstarter-funded project, accompanied by outreach to various relevant journalists and publications. A podcast that garners social media buzz, followed by links from bloggers who write opinion pieces about it. A significant philanthropic event, such as a donation to a charity, which garners interest by local news journalists, who write a story about it and link to your brand. A tweet that goes viral, sparking conversation from bloggers or news journalists who, in turn, link to your website when citing your comments. An interview with another website, which publishes the interview and links to your website within the interview. Sending a review copy of your product to a blogger, who then reviews it and links to your site within their review. Original market research analysis/report compiled from the results of a survey. Exceptionally well-written blog posts on your website that provide immense value for readers. Exceptionally well-designed infographics on your website with unique or interesting insights. An exceptionally interesting or controversial guest blog post that generates buzz from other bloggers eager to chime in with their opinions, who link to your company when referencing your job title. The list could go on and on with other examples of link-generating content, both online and offline, and on-site and off-site. The bottom line is that, by creating an original piece with real value, like a market research survey, others in your industry will cite your work when referencing it in their own publications. Sounds awesome, right? There’s only one obstacle: the idea is simple, but the execution is much more intensive. First, producing content at this level isn’t easy. There’s a reason why people link to good content, and that’s because good content is hard to come by (and it’s hard to come by because it’s hard to produce). It takes creativity to come up with an original topic, effort and money to find original data for that topic, intensive research to supplement your ideas, and of course skill to put it all together. After that, you have to make an effort to syndicate your work because audiences usually won’t just happen upon it naturally. Even with those steps in place, there’s no exact formula for content success, and there’s no guarantee of results. On the other hand, all it takes it one breakout piece of content to land you dozens – or even hundreds – of natural, valuable inbound links. Guest posting is a more direct approach than earning links naturally, since you’ll technically be building the links yourself. However, because modern link building restrictions are so tight, you can’t just stuff your link into any piece of content. It needs to be high-quality content, and your link needs to be both relevant and valuable for the piece itself. Beyond that, your content also needs to be relevant for the publisher’s target audience, be in line with their brand, and most importantly, avoid advertising your brand directly. Your content needs to be inherently valuable for readers; not an advertisement for your brand. In addition to increased authority, you’ll also earn residual referral traffic to your site, making guest posts an all-around valuable strategy. One of the greatest advantages of guest post-based link building is its scalability. You can start by getting your work featured on entry-level sites, such as local authority or niche industry blogs, and scale your way up to high-profile national publishers, earning more and more link juice with each step on the ladder. Using a tool to find mentions of your brand name which are not currently hyperlinked, then emailing the author or webmaster to request that they link your brand name. Using a tool to find broken links on relevant industry publications, and emailing them to offer a suitable replacement URL (on your site) to replace the broken link. 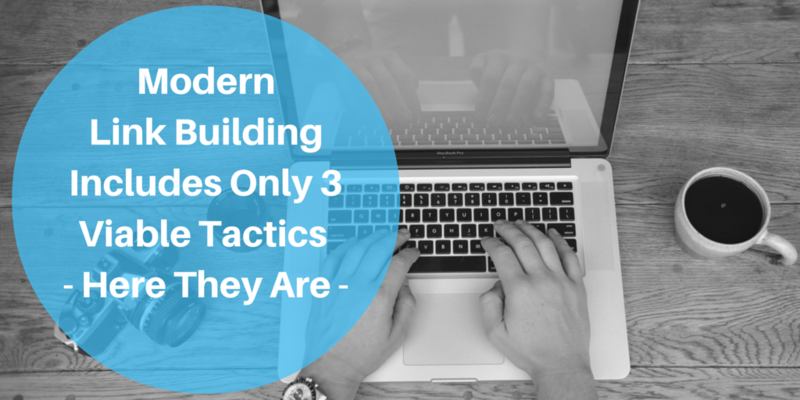 A good link building strategy will be diversified, with elements of all three of these tactics present. Guest posting and natural link attraction have complementary benefits, each making up for the other’s weakness, and each offering peripheral benefits unrelated to search rankings (such as conversion rate optimization and increased referral traffic). Link reclamation provides a way to extract value out of the past efforts of other people, which can provide an efficient return on time invested. Together, these tactics can almost guarantee you higher domain authority, rankings, and return on investment. Great article, Jayson. I love the section about Link Reclamation. It requires a bit of manual labor, but can build amazing value! Right but we’re assuming that these are the only viable tactics that result in “SEO” links, or links that have some impact on visibility through optimization. There are actually hundreds of viable link building tactics in 2016 depending on your industry and goals. Is it really wise to discredit temporary forum links when they do sell products, or citations for rankings? I think it’s best to look at links for their “eyeball potential,” not just what impact they’ll have on SEO juice. That’s actually where SEOs need to be putting their efforts in 2016, whether it’s one of your 3 viable strategies or not. SearchEngineJournal. Looking forward to work with you in the future. Really impressive article!It is effective and helpful strategies. Your techniques seems to work, I am gonna try this Guest posting tactic,old link building ways are not working, this link building strategies are the modern ones so I think this is useful for me. Thank you for sharing. Link building is an art. It’s almost always the most challenging part of an SEO’s job, but also the most critical to success. Link building requires creativity and hustle. Jayson you have shared really useful tips to successful link building which will go a long way for any link builder. Great job! found it interesting, but does it mean that having my site url on one’s comment section will cause google to penalize me? Is it not safe again, should we/i stop it entirely? ?